A casual breeze wafted through a sunny Killian Court on Friday, June 7 as 2,009 expectant graduates prepared for the graduation celebrations and started off on a new stage of their lives. "Once again we are gathered in Killian Court, the great court of MIT, to celebrate accomplishment, heritage, and passage. This ceremony celebrates your accomplishments during your student years," said President Charles M. Vest. Vest said that the graduates enter the world at a challenging time. "We live in an age that seems to reject bold thought and bold action," he said. "We invested over two billion dollars [in the superconducting supercollider], and brought the project almost halfway to completion. Then we simply changed our mind, walked away, and left a rusting hulk in arid Texas desert." "Now it is time for you to recognize the opportunity before you. You must return to a boldness of spirit, thought, and action," Vest said. "Openness and meritocracy are what have made MIT great, and you must continue that spirit and philosophy in your life endeavors." Vice President Al Gore spoke at MIT's 130th Commencement, highlighting the growing gulf between society and technology. "The metaphors of science are no longer migrating into our popular culture," he said. "In the second half of the 20th century, while the number of new discoveries flowing out of the scientific revolution is at least a thousand-fold greater, the flow of these metaphors into the rest of society has slowed to a trickle," Gore said. 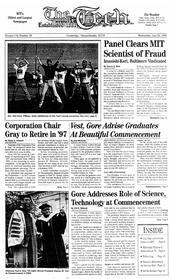 There exist also tensions within the technological community, Gore said. "The new capacities conferred by new discoveries in science and technology clearly have a promising potential for good and beneficial effects," he said, "but simultaneously provoke widespread and deep concern that the use of these new powers can be disruptive and harmful." Despite this, "a fear of chaos cannot justify unwarranted censorship of free speech, whether that speech occurs in newspapers, on the broadcast air waves, or over the Internet," Gore said. The real solution was to take all of the new information and put it into the context of the lives we already live, Gore said. "The most important breakthroughs and advances in understanding can come only when we take the time to look beyond the surface of the problems we face and focus on what is most important in our lives." Matthew J. Turner '96, the president of the graduating class presented Vest with the senior class gift, a Public Service Center fund currently worth $20,000 and projected to increase to $69,000. The fund is designed for "students who like to do community service," but need grant money to pursue it in lieu of a job, Turner said. Barbara J. Souter G, the outgoing president of the Graduate Student Council, took the opportunity to congratulate the graduating students. "We were told when we arrived that we were outstanding students capable of many things, but until this day we were not able to believe it," she said. "MIT ispeople with blinding insight, she said. "Teachers and students, researchers and administrators make MIT a driving center of academic excellence," she said. "MIT is you," she said, "when you leave you take a part of it with you."